Colombian police stand alongside recovered bodies of children who died in a burned bus in Fundacion, Colombia. 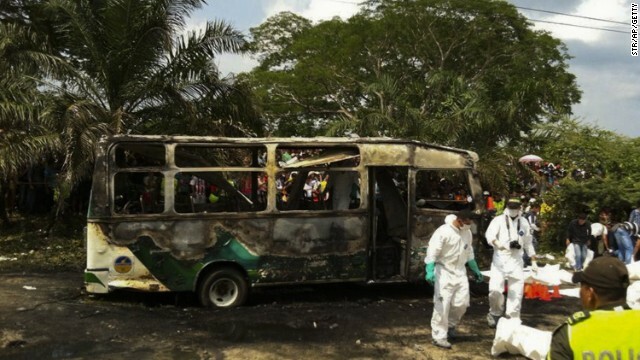 (CNN) -- A bus packed with children burst into flames in Colombia on Sunday, killing at least 32 people, officials said. The bus was picking up children from an event at a church in Fundacion, Colombia, when the blaze began, Col. Adan Leon told CNN affiliate Caracol TV. "Everyone started to scream and run," a child who was on the bus told Caracol, describing how he escaped through a window. Victims of the deadly fire included 31 children and one adult, Harry Aaron, a civil defense official in Magdalena department, told CNN. Authorities are investigating what caused the fire, Leon told Caracol. One witness told Caracol that the driver went to get a drink and left children to put gasoline into the vehicle's tank. Colombian President Juan Manuel Santos expressed condolences on Twitter Sunday and traveled to the northern Colombian municipality to be with victims. "The country is in mourning," he said.